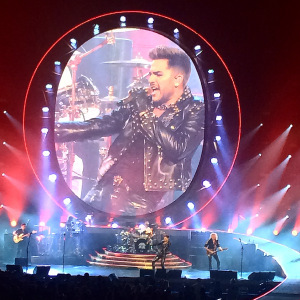 You are here: Home / Tours and Live Performances / 2014 Queenbert Tour / Adam Lambert + Queen – Giving Us a Laugh and Another Great Write-Up! Adam Lambert seems to be enjoying his Twitter time lately. In addition to some friend pictures, he gave us and adork-able Instagram and a write up he liked. So, it shows he is reading up on his Queen tour! This morning came an article from New Zealand’s Sunday Star Times, promoting their upcoming tour. Adam really liked this and send it to us, via Twitter. I even learned a little more from it about when Queen appeared on the American Idol finale with Adam. I’ll start it and give the link for you to finish it. How strange to be Adam Lambert. Here he is, a global pop star in his own right, now touring the world playing understudy to a ghost. In 2009, Lambert was runner-up on American Idol. He has since topped the US singles charts, and made two albums that sold a couple of million copies. His solo career has taken root in unexpected places: in 2012, he was the only Westerner invited to sing on China’s most popular TV show, his performance beamed out to 520 million viewers. But for the past few years, he has become best known for slipping into a dead man’s leather pants and heading out on the road as frontman with Queen. In many ways, it makes perfect sense. As a flamboyant gay man with abundant charm, a killer voice and a penchant for glam theatrics, he is three-quarters of the way there. But he is not Freddie Mercury. “No, that’s true,” agrees Lambert, who is backstage in a Toronto dressing room getting ready for a sold-out Queen show. Is he the champion, my friends? Will he, will he rock us? Scaramouche, Scaramouche, can he do the fandango? We will soon see, as Lambert fronts Queen when they perform here in early September, their first tour to New Zealand since 1985. I was never a big Queen fan with the exception of liking a few of their songs. However, this show is truly incredible! I have always been a very huge Adam Lambert fan, since I first saw him in “Wicked” in Los Angeles, long before his star turn on American Idol. This pairing with Queen is truly a marriage made in heaven. What a magnificent talent and his uncanny ability to just about bring Freddie Mercury back to life through this show is miraculous. But yet, Adam still manages to showcase his own unique talent which shines through with every note. Quite a tour de force! I just wanted to say that I think he is so beautiful with blonde or black hair. He is so cute. I absolutely love his voice and I hope he gets a third album out. I will be the first one to buy it. What a great article. GRANT SMITHIES really “gets it”. He “gets” what Queen is doing and he “gets” Adam. If he is writing like this before having seen the show, he is in for a rare treat when concert day arrives. I had always wondered about the “hows and whys” of Queen appearing on American Idol. I wondered if it was Simon Cowell using his connections as he did with the call to “U2” to obtain permission for Adam to sing “One”. I would also love to know what Adam’s parents thought/think about him performing with Queen. I wonder if they will ever get over the shock & fantasy of their son singing on stage with their music idols. Adam’s life since Idol has been a steady progression in the right direction. It’s is so exciting to watch his career grow. I did read this and loved it. I think I tweeted a response. Adam intelligence is almost as amazing as his voice. He continues to enhance his career with his outgoing personality, his enthusiasm, and his tenacity. Another great write-up! There will always be the odd negative comment or write-ups out there…cause that’s life! Having been blessed to see the Queen/Adam concert here in Vancouver, Canada this passed June 28th was totally “OUT OF THIS WORLD”! Queen…plus Adam…singing some of the best music to date….totally PRICELESS!!! Loved every minute of it! Adam’s career is indeed headed in the right direction…FINALLY! I look forward to embracing new “Glamberts” once the tour is complete & exposes Adam for the AMAZINGLY GIFTED & TALENTED entertainer that he truly is! The anticipation of his new album next year is driving me insane. Can’t wait…and I know that this successful tour will surely help to support Adam in his career that will eventually hit the Stratosphere! Well deserved Mr Glambert! I hope all of you international fans are enjoying him!